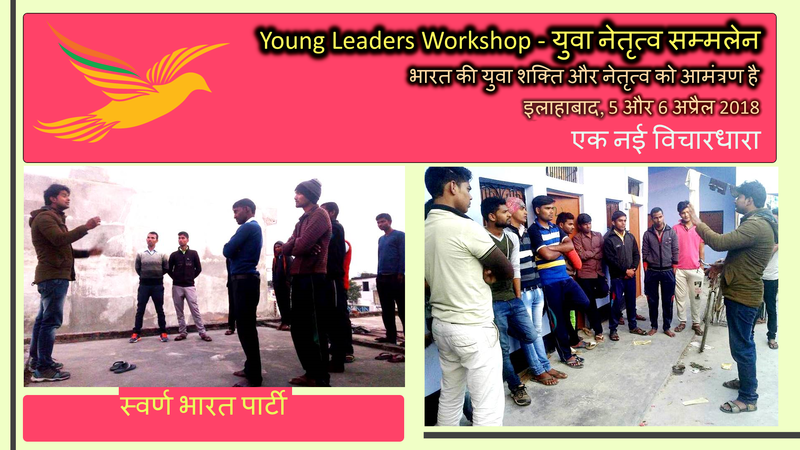 Mr Rahul Pandit, Working President of Swarna Bharat Party, India’s only liberal party, issued an invitation to those youth of India who are determined to transform India’s future to express their interest in attending a Young Leaders Workshop on 5 and 6 April 2018 in Allahabad. Details are on the party’s website at http://swarnabharat.in/workshop-allahabad. Swarna Bharat Party has found a major uptake of its message of security, justice, liberty and equalit of opportunity, at the grassroots. Ideal leaders for this workshoip will be rooted in the ground and have an open mind to learn new ideas. Leaders found suitable will potentially be given the party’s ticket to contest Lok Sabha elections in 2019.